At points during the new, third season of “True Detective,” which is better than the much-loathed second season but flimsier than the first, you may feel as though you’re playing three-level chess. The story line is split into three time periods — 1980, 1990, and 2015 — and the series, which returns to HBO Sunday night at 9, jumps between them unceasingly. It’s not confusing at all; the makeup and hair departments make sure of that. But the leaps keep you working to piece everything together, to understand the changing specifics of the original crime — two kids gone missing in Arkansas — and to figure out why the personal life of the cop leading the case, Mahershala Ali’s Detective Wayne Hays, is so entwined with it. In the process, Nic Pizzolatto’s series is entertaining enough, but not always in the way it wants to be. Pizzolatto, who wrote all eight episodes, with David Milch co-writing episode four, tries to infuse the material with some of the dark magic and cockamamie philosophizing he blended into season one, the season with Matthew McConaughey and Woody Harrelson that made the show’s reputation. With everything from a Black Sabbath T-shirt, creepy dolls made of straw, ominous music, and abstruse references to the undeniability of time, he works to gin up the gothic vibe and, perhaps, online theorizing. He treats the show’s mystery as if it contains some secret grim wisdom of the ages, as if he enlisted McConaughey’s Rust Cohle, the “time is a flat circle” dude, as a script consultant. But really, it’s best experienced as a straight-up procedural whodunit, a “Law & Order” that’s a bit extra. The new “True Detective” is more enjoyable as a crime drama featuring a few strong performances and a textured Ozarks setting than it is as some kind of laden meditation on death, memory, and the tar pits of human nature. The pulse of the five episodes HBO made available for screening derives primarily from the mesmerizing work by Ali and by Scoot McNairy, who plays the drunken, anguished father of the missing kids, and from the subtle way in which their parts are written. Ali’s Wayne is, to me, so much more believable and, as a black cop dealing with Deep South racism and shifting codes, interesting than anyone in the series so far. The other baloney, including a guy with a dead eye, is best discounted; remember how little the murky stuff mattered in the denouement of season one and learn from that. 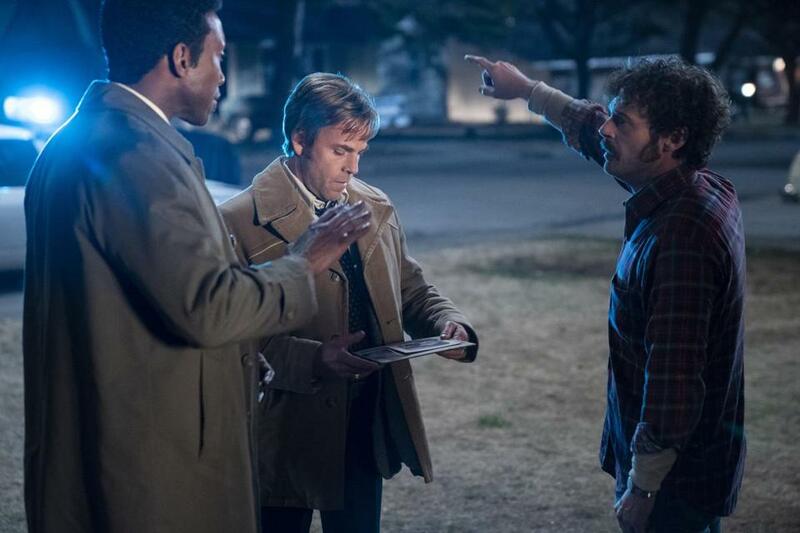 The first Wayne, in 1980, uses his gift as a tracker during the Vietnam War to search for the kids along with his partner, Roland West (Stephen Dorff). He’s emotionally restrained, which is a good thing since the parents of the missing kids are a mess, particularly the irresponsible mother and cheating wife, played at times like a caricature by Mamie Gummer. He also recedes into himself at every racist comment. Even so, and this is a testament to Ali’s performance, we somehow see all the feelings he is suppressing. We also clearly see his attraction to one of the kid’s teachers, Amelia (Carmen Ejogo), even though he’s an almost comically reserved suitor. By 1990, Wayne is more defined, as he returns to the case when new information emerges. This Wayne is married to Amelia, but their relationship is fraught. He finds her interest in the missing-kids case threatening. The third Wayne is hard to watch. Now elderly and retired, he is suffering bouts of dementia that leave his history just beyond his reach, and we see some of his hallucinations and vague memories as he does, as if they’re real. He has agreed to talk to a media outlet about the old case, which triggers both clarity and confusion for him. There appears to be new evidence, which pushes him to revisit the investigation and, simultaneously, try to recover some of his past — and yet he knows that he is operating at a deficit. With these three glimpses across decades, Ali gives us a complete picture of a man, with consistencies throughout, and yet changes wrought on him by circumstance. His performance gives the season its unifying theme, and at times the case is most compelling for the ways it intersects with his life. Despite the shadowy distractions, “True Detective” is a solid procedural led by a faceted leading performance. Starring: Mahershala Ali, Stephen Dorff, Carmen Ejogo, Scoot McNairy, Mamie Gummer, Sarah Gadon. On: HBO, Sunday at 9 p.m.